Hi everyone! 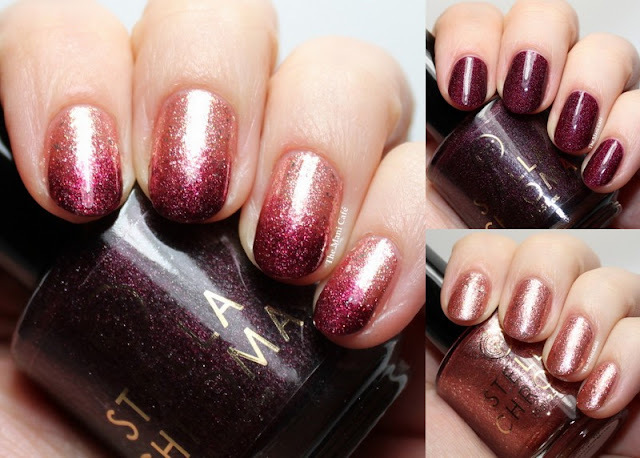 Today I have a Limited Edition Holiday duo from STELLA CHROMA to show you! Pam is releasing a couple of trios and this duo for the holiday season. I'll have those up soon as well so be sure to check back but for now, let's get to this duo! Merlot Ho Ho! is a rich burgundy red with a unique holographic shimmer. I used 2 coats, no topcoat. The formula was absolute buttery perfection. This is exactly the kind of colour I find myself gravitating to for regular use. I'm sure it will become another favourite in my collection. Rosé Til Champagne is a luxe rose gold metallic foil polish with shining silver flakes. I used 2 coats, no topcoat. This is another beauty of a polish and an amazing colour and finish for the holiday season. I love the chunky silver flakes in this which make it super unique. I have a few rose gold polishes in my collection but none like this with this texture. I couldn't resist creating a gradient with these. The two shades just go so well together and scream festive to me! I sponged Merlot Ho Ho! onto the tips after applying two coats of Rosé Til Champagne and finished with topcoat. These two polishes will be available as a set for $24. The duo will be released on Black Friday (November 23rd) at noon EST and will be available through the end of 2018. Absolutely lovely, Michaela! Thank you for sharing!